Myostatin is a negative regulator of skeletal muscle growth. Truncating mutations in the myostatin gene have been reported to result in gross muscle hypertrophy. Duchenne muscular dystrophy (DMD), the most common lethal muscle wasting disease, is a result of an absence of muscle dystrophin. Although this disorder causes a rather uniform pattern of muscle wasting, afflicted patients display phenotypic variability. We hypothesized that genetic variation in myostatin is a modifier of the DMD phenotype. We analyzed 102 Japanese DMD patients for mutations in the myostatin gene. Two polymorphisms that are commonly observed in Western countries, p.55A>T and p.153K>R, were not observed in these Japanese patients. An uncommon polymorphism of p.164E>K was uncovered in four cases; each patient was found to be heterozygous for this polymorphism, which had the highest frequency of the polymorphism observed in the Japanese patients. Remarkably, two patients were found to be heterozygous for one of two novel missense mutations (p.95D>H and p.156L>I). One DMD patient carrying a novel missense mutation of p.95D>H was not phenotypically different from the non-carriers. The other DMD patient was found to carry both a novel mutation (p.156L>I) and a known polymorphism (p.164E>K) in one allele, although his phenotype was not significantly modified. Any nucleotide change creating a target site for micro RNAs was not disclosed in the 3' untranslated region. Our results indicate that heterozygous missense mutations including two novel mutations did not produce an apparent increase in muscle strength in Japanese DMD cases, even in a patient carrying two missense mutations. Duchenne muscular dystrophy (DMD), the most common inherited myopathy affecting approximately one in 3,500 males, is characterized by muscle dystrophin deficiency. Dystrophin deficiency is caused by translational reading frame shifts or nonsense mutations in the dystrophin gene . DMD is a rapidly progressive disease occurring during childhood that causes affected individuals to lose their ability to walk by the age of 12 years old before they succumb during their twenties due to either respiratory or cardiac failure. DMD is known to progress with a rather uniform pattern of muscle weakness, However, the existence of a modifying gene has been suggested due to the identification of unusually mild DMD phenotypes [2–4]. Some phenotypic variability has been explained by the precise locations of the mutations and their effects on the dystrophin-dystroglycan complex [5, 6] or by the identification of aberrant splicing products from the dystrophin gene [7–10]. In some cases, however, the same dystrophin mutation has been reported to result in different phenotypes [11, 12]. Although some phenotypic variability may arise due to environmental factors, such as diet or exercise, there are likely to be contributions from genetic components. In fact, differences in genetic backgrounds have been shown to influence the phenotypes of mice with a dystrophin-glycoprotein complex disorder caused by a mutation in the σ-sarcoglycan gene . Therefore, it is highly plausible that unknown genetic factors modify the phenotype of DMD. Myostatin, also known as growth and differentiation factor 8 (GDF8), is a muscle-specific secreted peptide that functions to limit muscle growth . Several studies analyzing mutations of the myostatin gene have been conducted in the Western worlds [15–17]. To date, six polymorphisms and one intronic mutation have been identified in the myostatin gene. One of the identified polymorphisms (p.153K>R) has been associated with a hypertrophic response in muscles due to strength training . Recently, an infant was identified with the first homozygous disruption of the myostatin gene, which resulted in the child being exceptionally muscular at birth and unusually strong with increased muscle mass at four years of age . Remarkably, a single nucleotide change creating a potential illegitimate micro RNA target site in the 3' untranslated region of the sheep myostatin gene was disclosed to cause translation inhibition leading to the increase of muscularity . Furthermore, disruption of endogenous myostatin by gene or RNA targetings was shown to result in anatomic, biochemical, and physiologic improvements in the dystrophic phenotype of mdx mice, a mouse model of DMD with a nonsense mutation in the dystrophin gene [21, 22], including particularly prominent enlarged fiber diameters and greatly reduced fatty fibrosis. These results suggest that blocking endogenous myostatin is a potential strategy for treatment of DMD . We hypothesized that genetic variation in the myostatin gene modifies the phenotype of DMD. Therefore, nucleotide changes in the myostatin gene were investigated in Japanese DMD patients, resulting in the identification of novel mutations. One hundred two DMD patients that were followed up at Kobe University Hospital were enrolled into this study. All of the mutations in the dystrophin genes were revealed to introduce premature stop codons in the dystrophin mRNA; 51 cases with mutations that induced a translational reading frame shift due to exon deletion or duplication, 31 cases with nonsense mutations, 12 cases with mutations of one or a few nucleotides deletion or insertion, and 8 cases with intron mutations that induced splicing error (data not shown). The subjects' ages ranged from 1 to 31 years old (average: 10 years old). Regular clinical check-ups, including determination of the serum creatine kinase (CK) levels, were performed at the outpatient clinic. The maximal voluntary isometric torque (MVIT) produced by the elbow flexor muscles and the knee extensor muscles was measured with a manual dynamometer (Microfet2 digital muscle tester, Value Medical Supplies, Hesperia, CA) with a precision of 0.1 Nm. A clear difference in the phenotypes was observed in the ages at which the patients became wheelchair bound, which occurred between the ages of 5 and 11 years old. Some patients, however, were able to walk independently after they were 12 years old even though they carried mutations that caused truncations of the dystrophin protein. Protocols of this study were approved by the ethics committee of the Kobe University School of Medicine. Blood samples were taken after written informed consent was obtained. Genomic DNA samples were prepared from the peripheral blood of the patients via the standard phenol-chloroform extraction method and were used as templates for PCR amplification. All three of the myostatin exons were examined by PCR amplification and direct sequencing (Fig. 1). Exons 1 and 3 of the myostatin gene were PCR amplified as previously described . Exon 1 was amplified as a 542-bp fragment, including 131 and 373 bp of the 5' untranslated and protein coding regions, respectively, as well as 38 bp of intron 1 (Fig. 1). 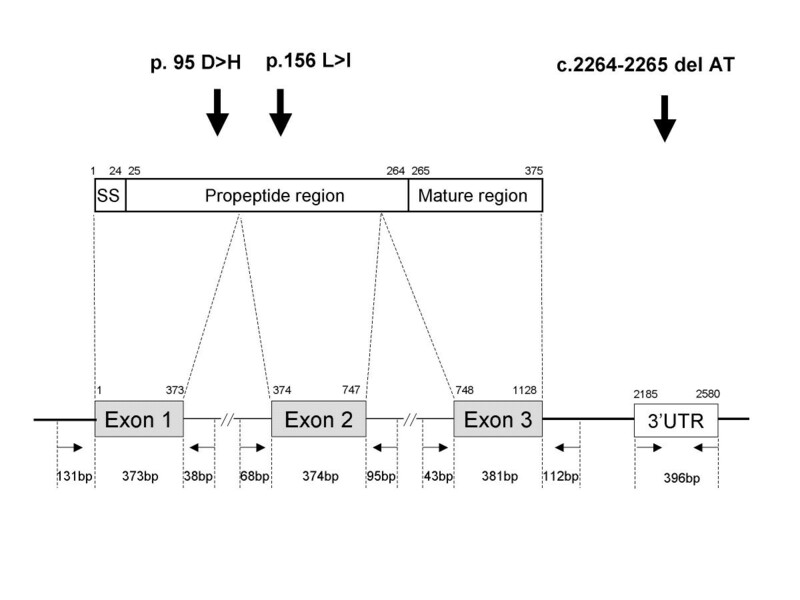 Exon 3 was amplified as a 536-bp fragment including 43 bp of intron 2 and 381 and 112 bp of the protein coding and 3' untranslated regions, respectively (Fig. 1). Additionally a middle part of the 3' untranslated region was amplified as 396-bp fragment using a set of two primers (3UF: 5'-CATGTCATGCATCACAGAAAAGCAACTACT-3' and 3UR: 5'-CAAAATCCCAATTTACAAAACAGAA-3'), since a single nucleotide change in this region of the sheep myostatin gene has been shown to create a microRNA target site, thereby leading translation inhibition . Exon 2 was amplified using two primers (2F: 5'-ATTAATATGGAGGGGTTTTGTTAATGG-3', 2R: 5'-GCTTAGGGAATTTGTAGCTATTTTCCA-3') that resulted in a 537-bp fragment, including the 374 bp of exon 2, and 68 and 95 bp of introns 1 and 2, respectively. Myostatin and the human myostatin gene. The structure of myostatin, including the signal sequence (SS), and the regions of the propeptide and mature protein, is schematically described (Top). The numbers above the boxes indicate the amino-acid residue position. 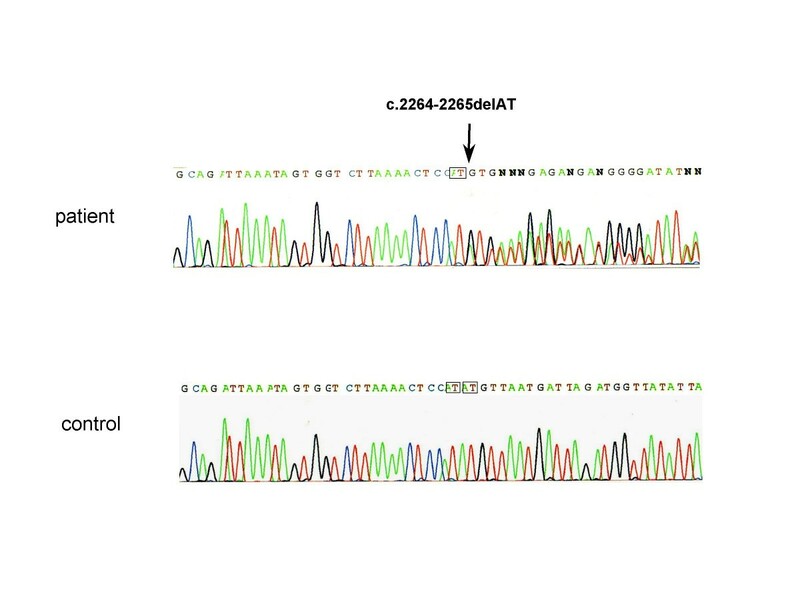 The vertical arrows indicate the locations of the two novel missense mutations and two nucleotides deletion identified in this study. The structure of the myostatin gene and the analyzed regions are schematically described (Bottom). Three coding regions (Exons 1, 2 and 3) and a part of the 3' untranslated region (3'UTR) of the myostatin gene were PCR amplified (boxes). The shaded and open boxes indicate the coding region and the sequenced region in the 3' untranslated region, respectively. Bold and thin horizontal lines indicate exons and introns, respectively. Horizontal arrows indicate the locations and directions of the primers used to amplify the regions. Numbers above the boxes indicate the nucleotide position according to the cDNA reference sequence in GenBank (accession no. : NM_005259), in which the "A" in the start codon is nucleotide #1. Numbers in the bottom indicate the size of each segment. Denaturation of the DNA was performed at 96°C for 5 min, followed by 35 cycles of denaturation at 96°C for 1 min, annealing at 60°C for 1 min, and elongation at 72°C for 1.5 min. The amplified products were analyzed on a 2% agarose gel and visualized by ethidium bromide staining. The PCR-amplified products were directly sequenced using a BigDye Terminator v1.1 Cycle Sequencing kit (Applied Biosystems, Foster City, CA) and an automated DNA sequencer (ABI Prism 310 Genetic Analyzer; Perkin Elmer Applied Biosystems). For subcloning sequencing, the PCR-amplified products were cloned into the pT7 blue T vector (Novagen, Madison, WI) and sequenced. 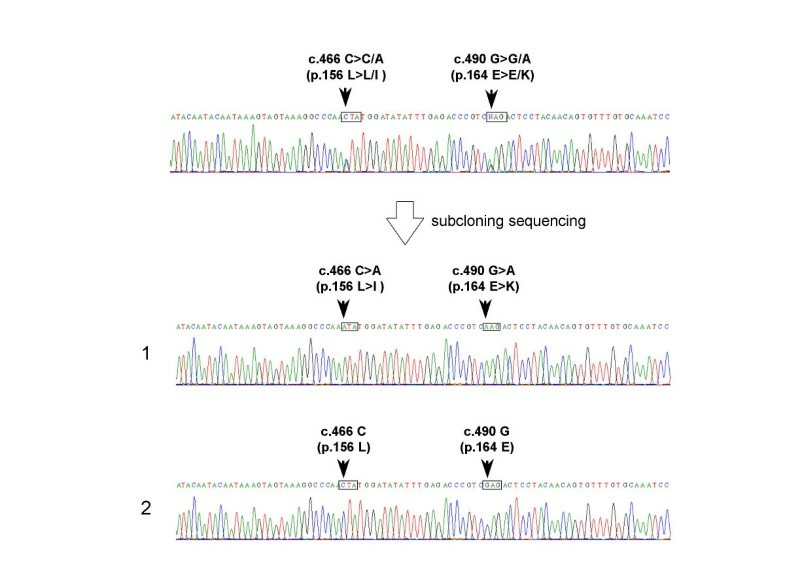 Sequencing results were compared with the wild-type sequence (Genbank: AC073120). All three coding regions and a part of the 3' untranslated region of the myostatin gene were successfully PCR amplified from genomic DNA; 102 DNA samples were subjected to direct sequencing. Sequencing results of the exon 1-encompassing region disclosed completely normal sequences in all of the samples except for one nucleotide change in one sample. In this case (case 712), direct sequencing revealed overlapping G and C peaks at the 283rd position of the myostatin cDNA (c.283G>G/C) (Fig. 2). Because this nucleotide position is a G in the wild-type sequence, the presence of a C at this position was determined to be a mutation (c.283G>C). A novel mutation in exon 1 of the myostatin gene. A part of the sequencing results for exon 1 of the myostatin gene from a DMD patient (case 712) is shown (patient). Overlapping G and C peaks are present at the 283rd nucleotide of the myostatin cDNA (c.283G>G/C) (Top). The single nucleotide change from G to C at the 283rd nucleotide of the myostatin cDNA (c.283G>C) changed a GAT codon to a CAT codon at the position corresponding to the 95th amino-acid residue of myostatin (p.95D>H)(boxes). The wild type sequence is shown below (control). c.283G>C changed the codon corresponding to the 95th amino-acid residue of myostatin from GAT to CAT, which substituted an Asp residue to a His residue (p.95D>H). This missense mutation was located at a conserved amino-acid residue in the propeptide region (Fig. 1)  and was predicted to affect the function of myostatin. Clinical examination of muscle strength, however, failed to reveal a clear difference between the DMD patient carrying this nucleotide change and the other DMD patients. At 8 years old, the patient could not stand up by himself, but was able to walk independently with a waddling gait. In the exon 2-encompassing region, overlapping G and A peaks at the 490th nucleotide of the myostatin cDNA (c.490G>G/A) were uncovered in four samples. c.490G>A corresponded to a known polymorphism that changes a GAG codon for Glu to a AAG codon for Lys at the position corresponding the 164th amino-acid residue of myostatin (p.164E>K) . The allele frequency of c.490G>A was 2.0% (4 of 204 alleles). Interestingly, in one of the four samples with c.490G>A (case 549), overlapping C and A peaks were also found at the 466th nucleotide of the myostatin cDNA (c.466C>C/A) (Fig. 3). Subsequent subcloning sequencing disclosed the presence of two clones; one was identical to the wild-type sequence (Fig. 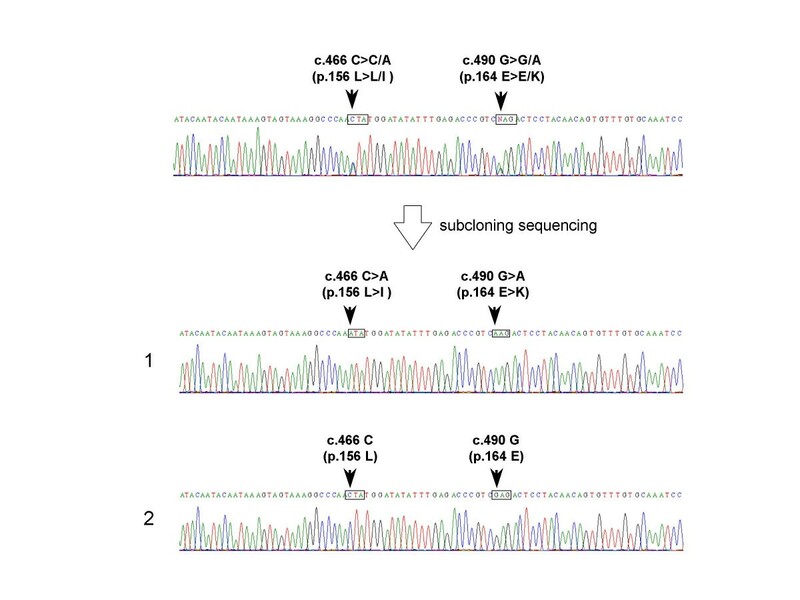 3), whereas the second clone carried the two nucleotide changes observed with direct sequencing: c.466C>A and c.490G>A (Fig. 3). c.466C>A, which has not been previously described, changed a CTA codon for Leu to a ATA codon for Ile (p.156L>I). Because the novel missense mutation was located at a conserved residue, this mutation was predicted to disrupt myostatin function (Fig. 1), particularly when it was combined with the second amino acid substitution located only eight amino-acid residues away. Clinical examination of the patient carrying the allele encoding two nucleotide changes did not disclose a clear mild DMD phenotype in the 14 year old. He was wheel-chair bound at 7 years old. The phenotypes of the other three DMD cases carrying c.490G>A in one allele were clinically indistinguishable from the other DMD patients. A novel mutation in exon 2 of the myostatin gene. A part of the sequencing results for exon 2 of the myostatin gene of one DMD case (case 549) is shown. 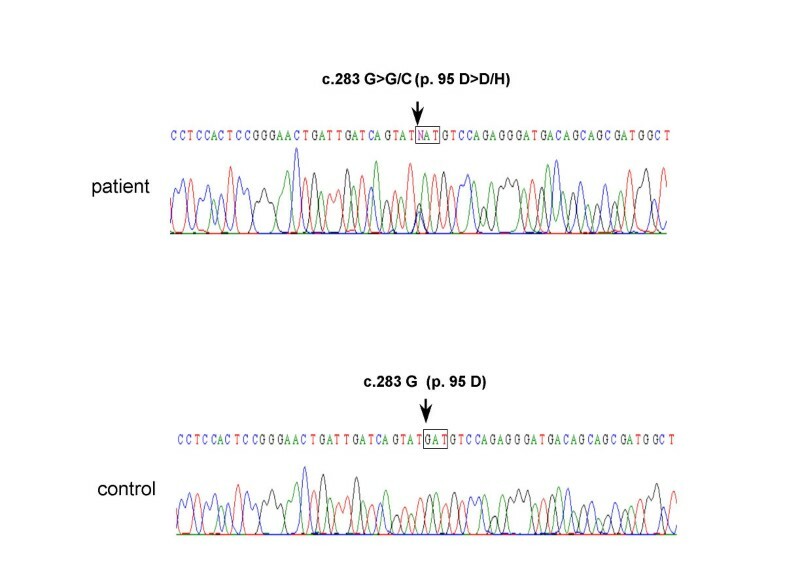 Overlapping peaks were observed at two locations corresponding to c.466C>C/A and c.490G>G/A in one DNA sample (Top). Subcloning sequencing disclosed two different sequences: one had a completely normal sequence (Bottom 2), whereas the other one had two nucleotide changes (Bottom 1). The G to A change at the 490th nucleotide of the myostatin cDNA (c. 490G>A) matched with the previously described p.164E>K mutation (box). The other nucleotide change from C to A at the 466th nucleotide of the myostatin cDNA (c.466C>A) changes a CTA codon for Lys to a ATA codon for Ile at the position corresponding to the 156th amino-acid residue of myostatin (p.156L>I) (box). None of these Japanese DMD cases carried p.55A>T or p.153K>R, frequently observed polymorphisms in the United States, or the single nucleotide change in intron 2 that has been reported to result in gross muscular hypertrophy (Table 1) . Moreover, examination of the exon 3-encompassing region (Fig. 1) did not disclose any nucleotide changes in the genomic samples. This was compatible with results obtained in previous studies. Data are from the USA, Italy, and Belgium [15-17, 27]. Sequencing of the 396-bp fragment of the 3' untranslated region revealed no nucleotide change, especially in the stretch of ACGTTCCA (an underlined G is 2402nd nucleotide where the substitution of G with A has been reported to create the octamer motif for the micro RNA target site in the sheep myostatin gene ). Exceptionally, one DMD case (case 100) was found to have a deletion of AT dinucleotides at 2264 and 2265th position (c.2264-2265delAT)(Fig. 4). Though the possibility for the deletion to create the motif for the microRNA target site was searched in this deletion sequence, no candidate motif for the microRNA target site was pointed out . Therefore this deletion seemed a polymorphism in the 3' untranslated region. A novel deletion mutation in the 3' untranslated region of the myostatin gene. A part of the sequencing result for the 3' untranslated region of the myostatin gene is shown. In the control all of the sequences matched with that of the wild-type sequence (Genbank: AC073120), including the repeat of AT dinucleotides (boxes) (control). In the sequence of one DMD case (case 100) the repeat of AT dinucleotides was not present, removing AT dinucleotides at 2264 and 2265th nucleotide (c.2264-2265delAT) (patient). Myostatin is a negative regulator of muscle growth that is attracting attention as a novel target for increasing muscle growth in cases of DMD . In this study, we conducted extensive sequence analysis of the myostatin genes in 102 Japanese DMD patients. As a result, two novel missense mutations (p.95D>H and p.156L>I) were identified (Figs. 2 and 3). In addition, a known polymorphism (p.164E>K) was identified in four of the DMD patients. Because one of the DMD patients carried p.156L>I and p.164E>K in the identical allele (Fig. 3), the overall mutant allele frequency was 2.5% (5 of 204 alleles). No truncation mutations in the myostatin gene, however, were identified in our study. In particular, the intron mutation that introduces a premature stop codon in myostatin mRNA resulting in marked muscle hypertrophy [19, 26] was not observed. Although a single nucleotide change in the 3' untranslated region of the sheep myostatin gene was shown to lead translational inhibition , any nucleotide change creating the octamer motif for the micro RNA target site was not disclosed in DMD patients. Exceptionally, one case was disclosed to harbor two nucleotides deletion in the 3' untranslated region (c.2264-2265delAT) in one myostatin gene (Fig. 4). It needs further study to clarify the meaning of this deletion. Both of the novel mutations (p.95D>H and p.156L>I) were predicted to be pathogenic because they are located at conserved amino-acid residues at the propeptide region of myostatin . The phenotypes of the DMD cases heterozygous for p.95D>H, p.164E>K, or p156L>1 and p164E>K, however, were not significantly different from the phenotypes of the other DMD cases. It has been reported that a mother carrying a truncation mutation in intron 2 of the myostatin gene appeared muscular, whereas her son, who was homozygous for the same mutation, showed remarkable muscle hypertrophy . Therefore, the muscle volume and strength of individuals that are heterozygous for myostatin mutations may not be markedly affected by these mutations. Considering that women with one missense polymorphism in the propeptide region of myostatin exhibited increase in muscle volume in response to strength training , it is supposed that the case with two amino acid substitutions can be phenotypically modified by providing proper muscle rehabilitation. Future studies will address this supposition. In order to clarify the roles of the two novel mutations, it may be necessary to identify cases in which the mutations are homozygous. In previous studies, homozygous polymorphisms in the myostatin gene have been reported to cause no clear changes in muscle volume or strength [15, 16, 27]. In this study, some of the DMD patients had mild phenotypes, such as an ability to walk independently past the age 12 years old (data not shown). Although we hypothesized that in these cases the mild phenotypes were a result of a modifier of the DMD phenotype, these patients did not have mutations in their myostatin genes. Particularly we have reported that aberrant splicing products of the dystrophin gene are a modifier of DMD [8, 10]. The variability of the human myostatin gene has been studied in Western countries (Table 1) [15–17, 27]. To date, six nucleotide changes (two are common and four are uncommon) have been identified in the myostatin gene (Table 1 and 2). Two polymorphisms, a G to A change at codon 55 in exon 1 (p.55A>T) and an A to G substitution in exon 2 (p.153K>R), were represented in 6.6% and 9.8% of the examined alleles in the USA . In an Italian study , the p.55A>T and p.153K>R were identified in 0.2% and 3.3% of the examined alleles, respectively. In a study in Belgium, only one individual from 57 males was found to be heterozygous for p.153K>R . None of the Japanese patients in this study, however, carried p.55A>T or p.153K>R (Table 1). These differences in the incidences of the polymorphisms demonstrate that there is a racial difference in the spectra of these polymorphisms. It is remarkable that four of the 102 patients were heterozygous for p164E>K, which corresponds an allele frequency of 2.0% in the Japanese patients (Table 1). The p164E>K allele was identified in only 2 out of 189 individuals in the USA, and was not observed in 120 Italians and 57 Belgians [15–17]. In one of the Japanese DMD patients carrying p.164E>K, a second p.156L>I mutation was found in the same allele (Fig. 3). Considering that p.164E>K was identified in both the Americans and Japanese populations, p.164E>K may be an old polymorphism that originated in a common ancestor of the two populations or the polymorphism is located at hot spot for nucleotide changes. The present study, although limited to DMD cases, showed the rare occurrence of mutations in the myostatin gene in Japanese subjects. Our results indicate that heterozygous missense polymorphisms including two novel mutations did not produce an apparent increase in muscle volume or strength in Japanese DMD cases, even in a patient carrying two amino acid substitutions. We would like to acknowledge Ms. A. Hosoda for her secretarial help. This work was supported by grants from the Ministry of Education, Culture, Sports, Science and Technology of Japan, Health and Labor Research Grants from the Ministry of Education, Culture, Sports, Science and Technology of Japan (Research on Psychiatric and Neurological Diseases and Mental Health); a Research Grant for Nervous and Mental Disorders from the Ministry of Health, Labour and Welfare; and the Mitsubishi Foundation. AN carried out the molecular genetic studies and drafted the manuscript. YT carried out the clinical and molecular genetic studies. KS and AN participated molecular genetic study. YO and MY participated in clinical examinations. MM conceived of the study, and participated in its design and coordination. All authors read and approved the final manuscript.